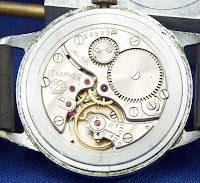 Interesting - I didn't know the origin of those Russian watches. Is Ronnie Barker known in the US at all? He did a few advertisements for Sekonda that can be found on YouTube. I've never heard of him. Those ads on Youtube have a distinctly English sense of humor to them. We've never had any significant presence of Russian or Soviet goods in the US. One of the most amusing exceptions was a Harley-Davidson pocket watch made in Russia--the stereotypical Harley rider has extreme "Buy American" views, and Russia is just about the least likely country to get an exception. "We've never had any significant presence of Russian or Soviet goods in the US." Very true. But there was a brisk trade in Soviet military memorabilia during the Cold War days, which usually came to the US via one of the NATO countries which bordered Russia. I always wondered how much was actual military issue, and how much was simply knocked together for sale to the Capitalist swine. there's been some trade in Russian goods since the end of the cold war, too. i've got a nice winter hat that's originally 1980's era Soviet navy surplus, imported by somebody running an internet-based business in the things somewhere in upstate NY. http://ushanka.com/ --- i'm just a satisfied customer, no business relationship. but do make sure to get the proper size, these things do NOT stretch. 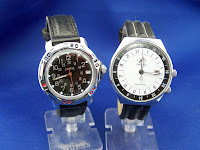 In the early 90's I picked up a Sturmanskie aviator's watch. It was pretty cheap, and I think it was for export, but is mechanical and has a stopwatch capability. Runs fine. Back at Three Letter Intelligence Agency, there were a lot of folks who went to Europe during the cold war. They'd trade with Russian soldiers, and one of the guys managed to collect a fairly complete (I think) Major's uniform. He wore it to work one day. Caused a bit of excitement. I'd have to look it up to be sure, but I think the Russian mechanical Chronographs are generally Swiss designs. Sometimes they bought the design and tooling legitimately, sometimes just copied without permission. 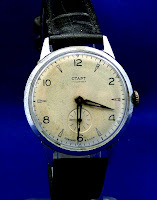 I have a similar CTAPT watch as the one pictured and it looks as if has the same dial patina. The Russians in the 1950s had a hankering for the old Omega Ranchero and I am informed that this is the nearest they could get to one! Some of the early Russian chronographs have increased in value over the years. 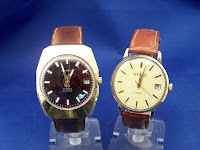 I bought the early Poljot/Strela new in Australia as a young man and I can't believe the price being asked now. If I had known, I would have been back for more!